Dr. Neufeld is well-known in educational circles for his conceptualization of the teachability factor as being the most important factor in the learning equation. He is asked to keynote on this subject in regional, national and international conferences. This particular recording is of a presentation to 1200 teachers at a regional conference in B.C. As many experienced teachers are aware, teaching is getting harder over the years. This phenomenon is rather ironic, given that curriculum has never been better honed, teachers have never been better trained and technology has never been so advanced. The problem, according to Dr. Neufeld, is that we are losing the natural contexts in which to teach our children. 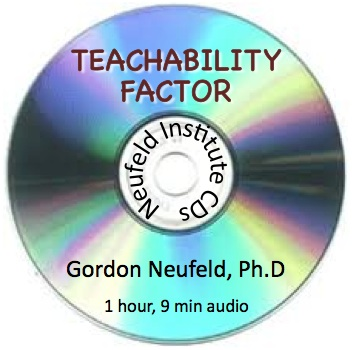 In this keynote presentation, Neufeld outlines the four natural contexts for learning, their erosion in today's society, and the implications for teaching.